Having a hammock during your holiday trip or camping can help you to relax and have an enjoyable vacation. 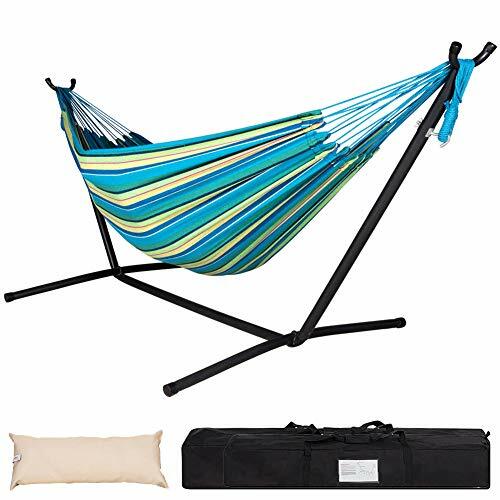 Now, if you are planning to bring a portable hammock to your next trip, you might want to consider investing in a hammock stand. In that way, you won’t keep on looking for a tree where attach your hammock. We’ve created a list of the top 10 best hammock stands that you can choose from. There are three factors that you need to consider when choosing one. First is the durability, the portability, and its stability. Allow us to present the best models you can find in the market today. 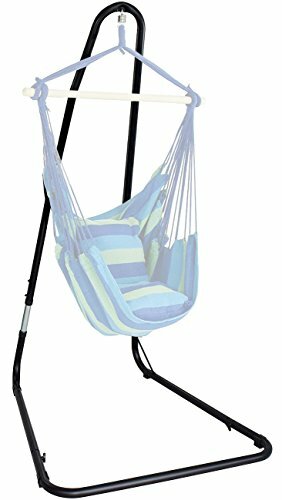 Lazy Days Hammock is known for strong hammock stands and our first item to review is not an exception. The hammock is made of durable canvas that can accommodate up to 450 pounds. It also includes a polyester stuffing head pillow to add more comfort while laying down. The stand is made of heavy-duty steel that can last for a long time. Thanks to its durable powder coating finish, it can resist rust and corrosion—making it an ideal choice for outdoor use. It also provides a generous bed area to ensure that you experience optimal comfort while using the product. It’s easy to set up and take down after use. A small carrying bag is also included in the package. Next, we have the double-hammock stand from Vivere. This Sunbrella hammock stand is the perfect choice for endless road trips and traveling. The package includes a space-saving double hammock and a sturdy carrying case. The hammock bed provides a generous amount and can accommodate two adults at a time with approximately 450 pounds of weight. It also features a 9-foot stand made of heavy-duty steel and can be assembled in just a few minutes. It requires no tools at all. The 100% polyester fabric is stain-resistant and can last for a long time. Buyers can enjoy a one-year limited warranty upon purchasing the product. Everyone will surely snap their heads into the direction of this unique-looking hammock chair stand from Sorbus. It can support most hanging stand chairs and swings. Thanks to its modern design, it complements your interior design or outside living room. To achieve optimal comfort, you can adjust the height of the hammock stand. It’s also portable and easy to relocate anywhere you want. Now you can rest under the sun anytime you want. It’s sturdy and durable; it provides a safe and secure feeling when you’re using the hammock. The sturdy powder-coated steel construction is weather and rust resistant. Set up only takes a few minutes and it’s ready to use. 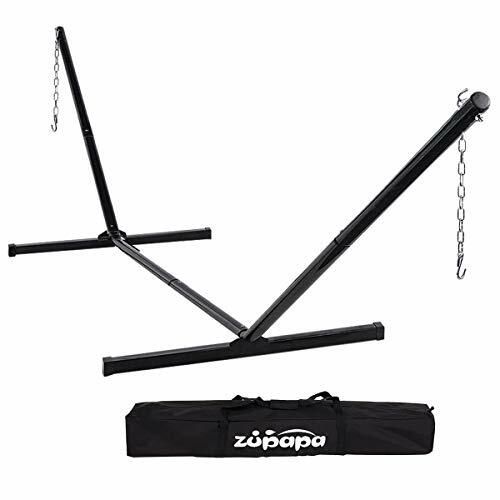 If you are keen about the durability of the hammock stand, you might want to check out this Zupapa hammock stand. It can fit for a single or double nest. 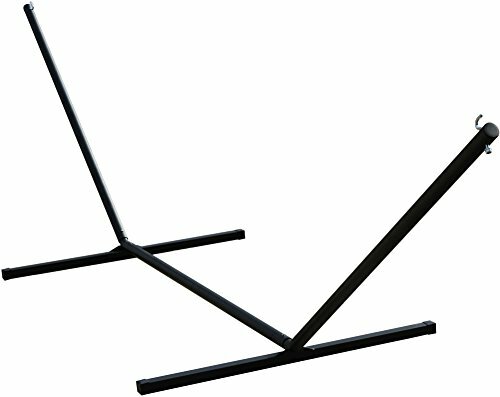 Regardless if you’re going to attach spreader or non-spreader hammock, this stand is for you. The package includes two chains and two S-hooks for fitting a variety of hammocks. The two-inch diameter 12-gauge heavy-duty steel structure is built to last. It is made of weather-resistant powder coated steel tubing that offers you a long lasting use with proper care and maintenance. This robust hammock stand is ideal for people who are constantly traveling or camping. It features a spring pin interlocking that makes assembly a breeze for anyone. The Sunnydaze 15-foot hammock stand is made of heavy-duty steel beam to last for a long time. It can also accommodate up to 400 pounds of weight capacity. 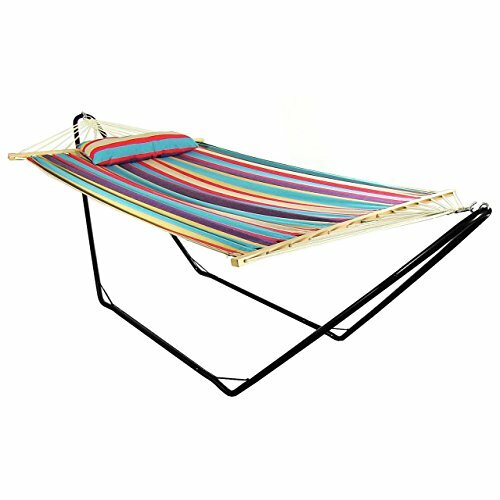 This hammock stand is ideal for a variety of outdoor hammock sizes up to 15 feet in length. Or you can use the adjustable hanging chains included in the package. 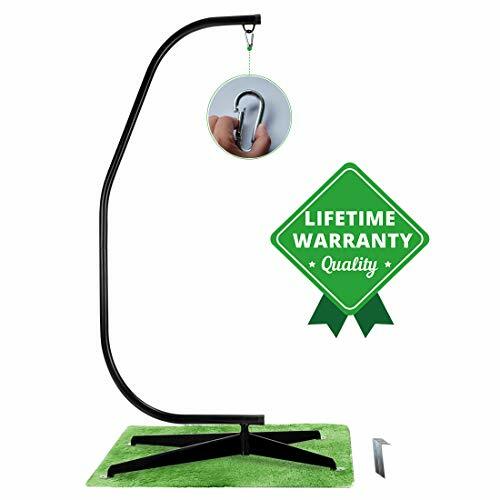 This hammock stand features a durable 1.5-inch square and 1.75-inch round steel tube frame with all ends capped for your safety. The rubber leg caps are designed to prevent water and dirt damage in the long run. It also includes a 20-inch long heavy gauge mounting chains for adjusting the height to your desire. 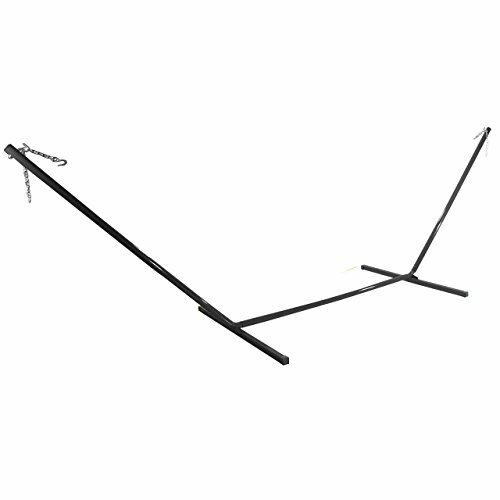 Another product we’re going to feature from Zupapa is this steel C frame stand for hammock chair. The maximum capacity for this hammock stand is 350 pounds. It provides excellent stability and security. The 48 mm diameter pole with 3mm thickness ensures you great durability of the product. Aside from that, the pole is powder-coated finish, and it’s resistant to the harsh elements of nature. Now you can use this product any time of the year. It can fit most of the hammock chairs including the egg hammock chairs. Its C-shaped design allows you to gain more space for sitting and enjoy the 360-degree swivel space. This hammock stand is designed to provide optimal relaxation and comfort. The round shape feet with a hole is suitable for any floor—be it concrete, wood, or marble. Check out this15-feet heavy-duty three-beam black hammock stand from Vivere. It is made of heavy-duty powder-coated steel tubing in an elegant black finish. The zinc-coated legs help to resist rust and corrosion, giving you the confidence to use the product outdoors. Without any help of tools, you can assemble the hammock stand in just a few minutes. The 15-feet hammock stand can also accommodate all types of double spreader bar hammocks. Its solid construction can support up to 450 pounds, and it’s one of the top-selling hammocks from this manufacturer. You can use any spreader bar hammock that’s up to 15 feet in length. Lounge by the pool all day using this Hammaka arc stands in bronze color. You can select your preferred height settings from 85 inches to 95 inches. It can support up to 300 pounds of weight. The hammock stand is made of durable and heavy gauge steel construction that can last for a long time with proper care and maintenance. You can use this hammock stand in almost all kind of hanging chair. The arc C stand is a great way to relax in your hanging chair. It also blends nicely in any modern landscape. Buyers can benefit from the manufacturer’s warranty upon purchasing the product. Another product from Sunnydaze Décor is this all-new cotton fabric hammock stand with a detachable pillow. The wildberry color will surely capture the attention of anyone who passes it. Aside from that, the fabric is soft and smooth, providing optimal comfort as you relax. The hardwood spreader bars are unfinished to give a natural look. 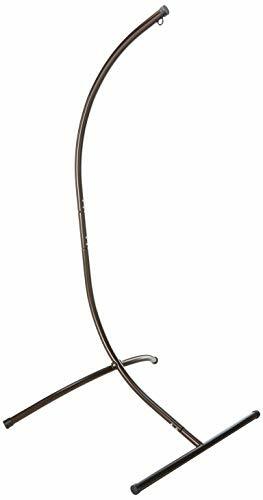 Thanks to its heavy gauge steel tubing stand, rest assured that it can last for a long time. 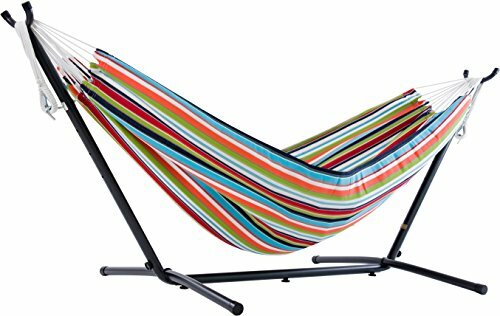 The portable hammock stand, detachable pillow, and hammock are easy to put together. Since it’s lightweight, you can bring it with you on camping trips aside from being an interesting décor in your patio or garden. It can also accommodate up to 300 pounds. Buyers can enjoy up to one-year limited warranty upon purchasing the product. Lastly, we have this new wooden curved arc hammock stand from ProSource. 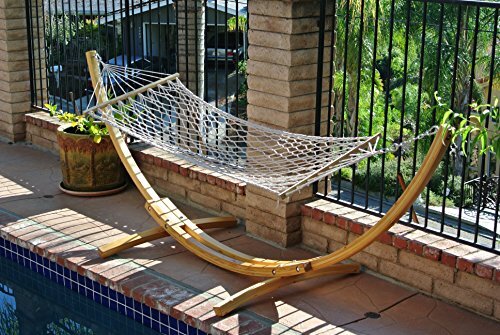 The wood material is waterproof and coated with UV resistant finish, allowing you to place the hammock stand outside of your house. The package also includes a quality striped hammock with a wooden spreader that’s safe to wash. This hammock stand is easy to assemble, all hardware that you’re going to need is included in the package. The hammock stand is not only elegant-looking but can also accommodate up to 300 pounds. The curvature bow provides optimal comfort to you when laying down the hammock. Despite its small size, it offers great stability once constructed.